33KV Outdoor Vacuum Circuit Breaker is designed to control the level of power supply with the safe limits to ensure efficient power supply to the devices. This circuit breaker is designed and manufactured under the stern guidance of our professionals using quality-assured components and advanced techniques in compliance with international quality standards. Exporter for Mombasa, Kenya, Uganda, Tanzania, Zambia, Zimbabwe, Botswana, South Africa, Namibia, Angola, DR Congo, Sudan, Nigeria, Ghana, Libya, Egypt, Saudi Arabia, UAE, Burundi, Rwanda, Djibouti, Ethiopia, Dar es Salaam, Johannesburg, Durban, Pietermaritzburg, Dubai, Doha, Qatar, Bahrain, Sharjah, United Arab Emirates, Oman, Mauritius, Malaysia, Myanmar, Burma, Philippines, Vietnam, Nepal, Sri Lanka, Bangladesh, Azerbaijan, Albania. 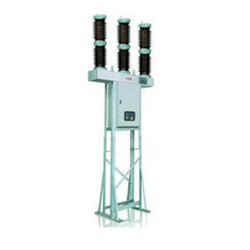 Keeping in mind the demands of industry and power sector, our firm is offering 33 KV Outdoor Vacuum Circuit Breaker. The provided circuit breaker is designed to control the level of power supply with the safe limits to ensure efficient power supply to the devices. This circuit breaker is designed and manufactured under the stern guidance of our professionals using quality-assured components and advanced techniques in compliance with international quality standards. Clients can avail this 33 KV Outdoor Vacuum Circuit Breaker from us in different technical specifications at industry leading prices.